Developed with professional mechanics, the ZB Clean brush is the essential 3 in 1 tool for cleaning the chain, freewheel and derailleur. Composed by 2 brushes ( Big and Small) and 1 scraper cleverly stored in the handle, it allows an efficient cleaning of the hard-to-reach areas of your bike. 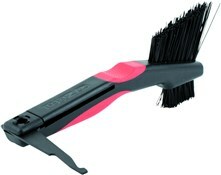 Big Brush - Ideal for cleaning the chain and freewheel. Small Brush - Perfect for derailleur and bearings.